It appears this category was having a problem as all posts from Feb 3 - Feb 24 seem to have been lost. ??? The forum since the beginning of the year has been quiet. I'm not aware of any problems with the different topic areas, unless you specifically remember posting something in this area which has disappeared? Yes, Scott, I posted something, however, I cannot see the post. If the humans on this planet stagnate, what about the animals, plants? Does our Evolution determine the evolution of the plants and animals? The reason for my question, I have this little bird (woodpecker) which constantly smashes into my window (because of the reflection)year after year until the bird injuries itself. My point is since we are somewhat primitive, does this applies to plants and animals? > I don’t know about the evolution question but maybe putting up some black tape in the form of plus signs, or other forms, might help the bird to avoid the injuries. Last year we put the "mirror like" window tint in all our house windows to keep the house cooler in summer months and also for privacy as no one can see through. Since then we had dozens birds that flew into them. We hear the loud bang. One time we found a dead bird at the bottom of one. If we known we would not have used the mirror like tint. And it is not cheap to re-tint a whole house again. I've placed some distractions on the windows, however, it continued like clockwork at 0800 hours. (my alarm clock..hahaha) Plus I want to do whatever I can to avoid "interfering" in the lives of animals, because we've done so much damage already to many species due to our overpopulation. I asked Christian Frehner about this. Subject: Re: FIGU name meaning change? The correct and actual name would be: FIGU, Free Community of Interests Universal. From now on it is replacing the former, long-used name "Free Community of Interests for Border and spiritual Sciences and Ufological Studies". The latter may be used as an additional information about what our objectives are, kind as a subtitle. My wife and I went on a one day trip with a group from the Montcalm Community College to Chicago, Illinois. We had our choice of going to the Museum of Science and Industry, Aquarium, Art Museum or the Adler Planetarium. You can guess where we went...yup, the Adler Planetarium! It was all interesting, but we went to one of the movie presentations called "Welcome to the Universe." Needless to say, I brought along with me some copies of a portion of Contact # 238 regarding our universe. A lady, probably in her mid 30's, narrated the movie. When it was over I had the chance to talk with her about the universe and present a copy of the 238th Contact report regarding the universe, SOL, galaxy, oldest material, Milky Way, age of the universe and its seven different belts. The pages I copied and handed to her comprised lines 637 through 667. Man! The feathers raised up on her and defended the knowledge of scientists. But, as you have pointed out, when there is a void of information in their studies and they can't prove it or have no knowledge of other possibilities (due to their refusal to leave a topic unknown until proven) they tend to insert a "guess" that invokes one to think that it is the proof.....when really they they don't know the answer and insert something "as if it were the truth." I impressed upon her the fact that if she would review the website "theyfly.com" she would become knowledgeable in the facts that the Plejaren have revealed. Of course, her rebuttal focused on "well then why don't they reveal the facts by contacting the US Government?" I counseled her on the fact that the Plejarens will only go through Billy to reveal the truths about the universe, but the US will not cooperate. They want to go directly to the Plejaren face to face. Such ignorance is unbelievable because the facts are in "plain sight." Well, I left my contact card with her... but time, and scientific pride, will dictate whether scientists will someday listen. So the big question is...."When Will The Listen?" Many of the staff were standing around to help people find their way around the Planetarium which gave me an excellent opportunity to hand out my contact (business) card regarding the teaching of the Billy Meier Story that I do as an eleven week study on Billy Meier and the Plejaren. 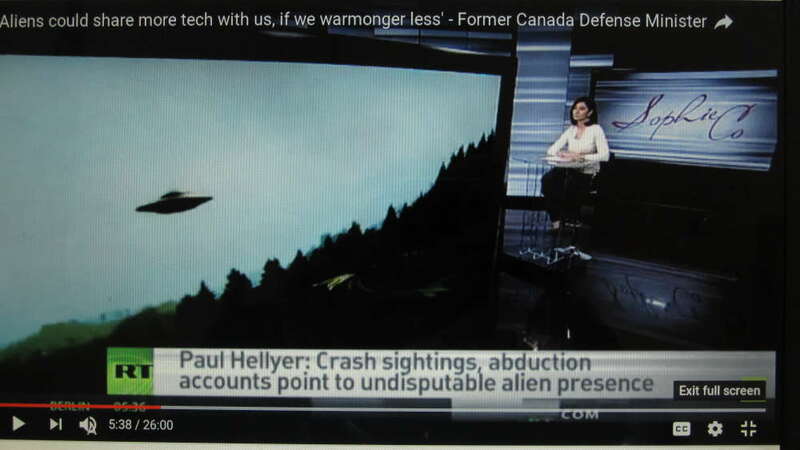 I urged them to get on the website "theyfly.com" and learn about this great visitation and knowledge that has been imparted to us by the Plejaren through Billy Meier. Well, just thought you might enjoy this email. Attached a pic of my wife and I standing next to a 1,000 lb. meteor that was at the Planetarium. The US goverment actually knows everything, they do know the case is real, are they? NASA is a great institution, but time will prove it's also a big joke. Look what I found on RT. Go to 5 minutes 38 seconds to see the origional. It only lasted for a split second. This is from one of the"Men in Black" movies. 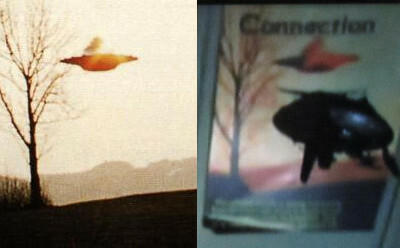 Notice on one of the posters it says "HIDDEN AGENDA" and "The Subversion Factory", next to Billys beamship photo. Subversion is the attempt to weaken or destroy a political system or a government. Lets compare the MEN IN BLACK movieclip to a cropped version of the origional. 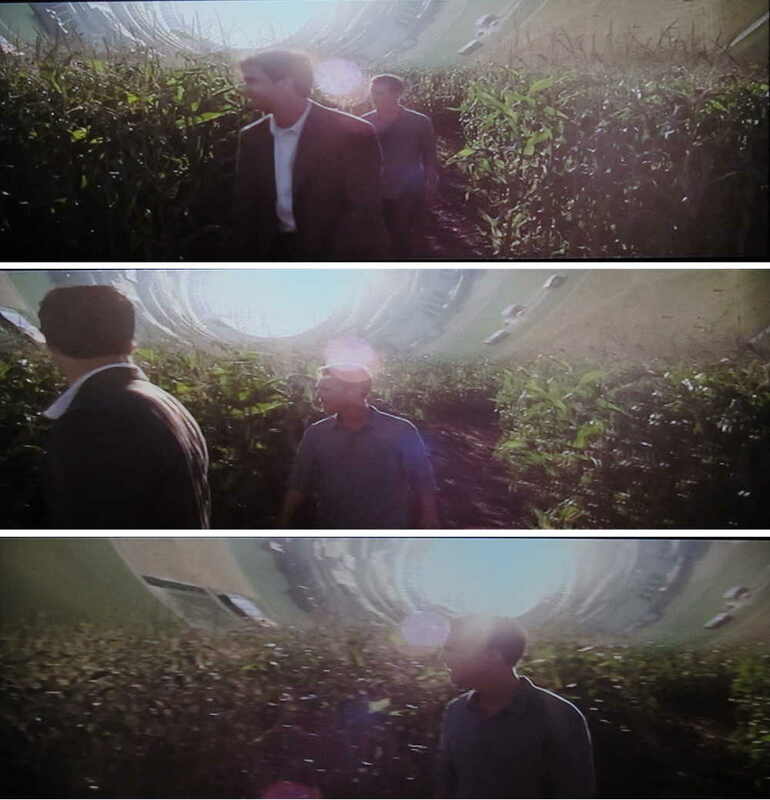 These are snapshots made from the science-fiction film Interstellar. Do they remind you of anything? If interested, this part is at the end of the movie. 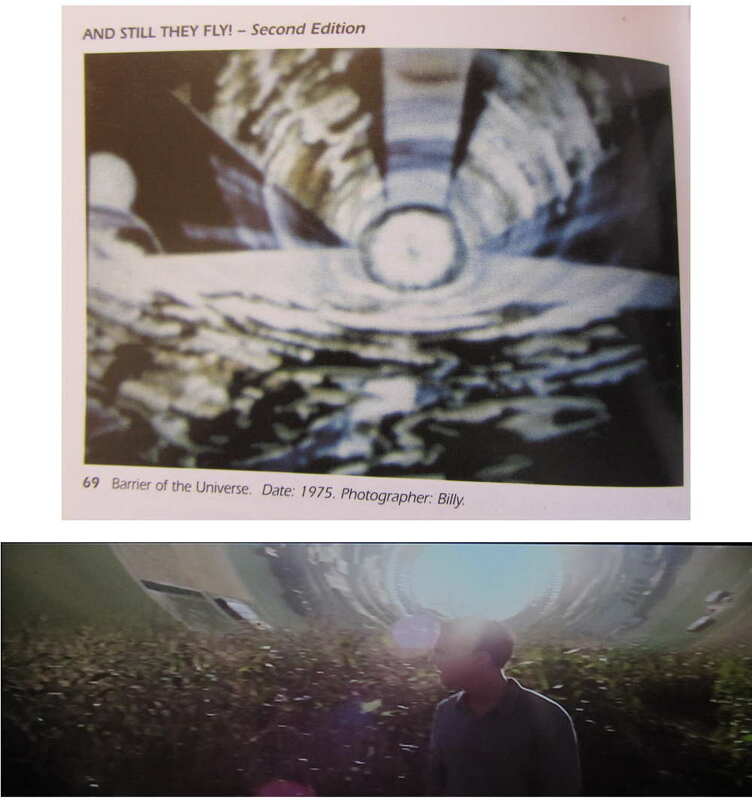 A clear connection between "the barrier of the Universe" photo and the snapshot from the science fiction film Interstellar. I bet if there was a world wide poll to have an open meeting with Ets/Plejaren they would vote overwhelmingly in favor of it. Shouldn't the Plearens listen to the citizens of Earth rather than cabal of secret un-elected rules. These Secret Service controllers don't represent the people of Earth! Many of my articles are about the wondrous oneness of the macrocosm and microcosm. And they may contain the �wrong� - the hailed inventions that turn to weapons/disaster - if man is prone to �create� with the aim/pride to achieve superiority..
�It is the mindset with which man lives that matters most. If he lives with the sole aim to become rich and famous his life will not be in tune with the laws of creation. -The genetic inheritance form our Sirian ancestors (the drive to overpopulate plus gene manipulations): we- their descendants � should not hate them for it because this would stop us from overcoming them and alienate us from the laws of Creation. - There was one article by a German University professor re. �open waters in Greenland� which � according to Edgar Cayce signal the beginning of the sinking of parts of America�s west coast into the sea. - A translation of a ZZ report about two mysterious ultrasound weapons which kill all life forms. - An article about NASA thinking of deflecting an asteroid via nuclear explosions in close proximity � just as recommended by Ptaah as the only correct way to deflect Apophis..
- The need to regain �spiritual cognition� and to become the �creator of our life� - by meeting our fellow man with equality, respect and reverence and to take control of the sentiment that forms in our consciousness � steering it towards a balance/equalised-ness (no excesses). - Aan article that worship enslaves humanity � which again stresses the need for seeing the equalised-ness of all Creation. Even a mistaken human being is on his evolutionary path � we should criticize his mistake but we should not hate him. - Articles that the �Times Of A Prophet� (i.e. Billy) are always turbulent..
- An article that our time (bullying tactics/nuclear weapons piling up / threat of a meteor hitting Earth) very much resembles what happened in the year 9498 BCE. - Several articles stressed the importance of the need to abandon hate and replace it with the creational impulses we call �love� � quoting Hilak and Sfath�s predictions for our time. My mistake and I apologize for that. It wasn't you who had posted something about escapism. It was actually Seth Whitaker on Michael Horn's blog. The �open waters in Greenland� signal not only an era of changes for America's west coast but for many parts of America, Japan and Europe. Re. America EC predicted "many portions of the (America's) east coast will be disturbed - including southern parts of Georgia and Carolina, the east coast of NY (NY City which will mainly disappear) as well as many portions of the west coast, as well as A's central portions - ultimately "the big lakes will empty into the Gulf (of Mexico)... but the greatest physical changes will be along the North Atlantic Seaboard. EC does not mention any dates and this all may not happen for quite a while. But the era of change has certainly begun. So folks, if you live in America, Japan or Europe's low lying areas keep a watchful eye. From Dr. Ron Pleune, Cedar Springs, MI. Just confirmed setting up two Billy Meier presentations (1.5 hr each) at the Library in Greenville, MI, on August 21, 2018, and another presentation at Hackley Library in Muskegon, MI. Will be presenting an 11 week series on the Billy Meier Story beginning June 2, 2018, at Sarns Resort near Hardy Dam in Michigan. From Dr. Ron Pleune, Cedar Springs, MI. Our study group has formed a non-profit group as of March 23, 2018, which is dedicated to the Teachings of the Billy Meier story, teachings of the Laws and Recommendations and ufology in general. Our group is called Living Truth Fellowship. We meet monthly for a potluck meal and the study of the Goblet of the Truth. I�m in eastern lower mi. Greetings ! As someone influenced a lot by the philosophy of Tao Te Ching, I believe the nature has exceptional ability to self-adjust and organize. To connect with the issue of overpopulation you have mentioned, do you think homosexuality is a natural response that mother nature has in order to self-balance the overpopulation problem? If so, should we encourage homosexuality? or to put it in a better way, should we enable people the chance to love whoever they want to despite the gender? Billy does not read this forum, perhaps others may have the answer and or answers you are seeking.